Set of 4 Wheel Locks $30 Save $2! 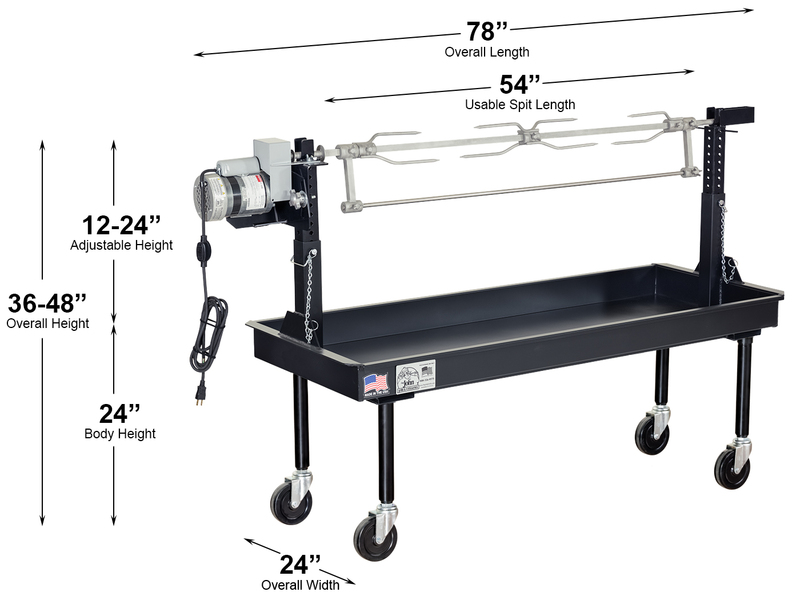 Big John introduced the “Low Boy” rotisserie unit and set the standard for permanently mounted commercial charcoal rotisseries. 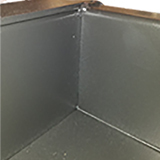 It is a combination of our original rotisserie permanently welded to our carbon steel firebox creating a one piece construction. 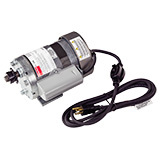 This shorter unit features 6”tall threaded, screw-in pipe legs and 5” solid rubber casters. This lower profile offers easy spit loading and unloading and the greatest stability. • Total rotisserie weight as pictured is 181 lbs. • Shipment Dimensions: 77”L x 28”W x 23”H = 28.70 cubic feet, shipping weight is 221 lbs. 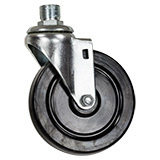 Heavy-duty nickel-plated steel brake kit for 5” swivel casters. All hardware included. 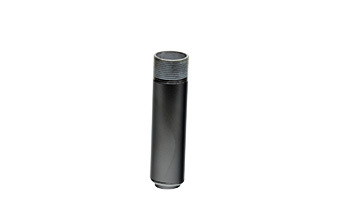 Our threaded, screw-in legs are made from 1” steel pipe with a powder coat finish. We chose a threaded leg as it is more reliable and sturdy than a pin-in or snap-in model, especially when maneuvering over uneven terrain. We chose to manufacture our rotisserie components from high-quality type 304 stainless steel. 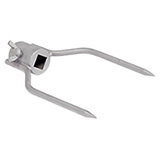 The spit, skewers, support bar, and support bar clamps are all poured stainless steel making them is ideal for this application because they are easy to clean and will not rust. 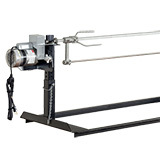 Roast with confidence knowing this rotisserie meets industry sanitation requirements. 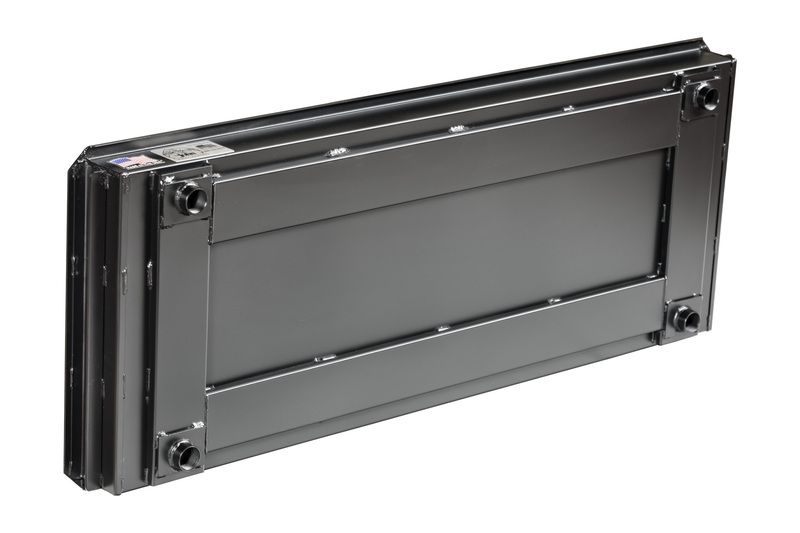 The screw-in legs and heavy-duty 5” casters make this grill perfect for off-premise events. Simply unscrew the legs and place them in the firebox for easy transportation and storage. If heading to an offsite event, put everything you need on the grill and wheel it to your destination, even if the terrain is a little rocky or uneven, the heavy-duty casters with an 800 lb. carrying capacity can take it.